To be effective in today’s challenging environment, marketers need not only to help their companies communicate with their buyer personas, but also to communicate effectively with their bosses—often the C-suite. To be successful with high-level executives, marketers need to simply explain what they have accomplished and what this translates to for revenue and business growth. They frankly don’t care about how you got there, rather they’re focused on the bottom-line: conversions. With HubSpot’s enterprise-level marketing automation platform, marketers will have all the reports necessary at their disposal to be successful with the C-suite. These reports help marketers improve and optimize their inbound efforts, while helping them pinpoint which activities are contributing to company revenue. Let’s dive into five HubSpot enterprise-reporting formulas that drive real value for the C-suite. 1. Where are contacts in the funnel? It’s important for your marketing and sales teams, along with C-suite executives, to keep their fingers on the pulse of your funnel. To do so, you must have an understanding of the lifecycle stages of your contacts. The Sources section in HubSpot is great for showing the amount of visitors, contacts and customers coming to your site, but it has it’s limitations. That’s where Contacts Reports come handy. Go into Reports Home, and select Create a New Report. Then select Contacts Report > Start from Scratch. You have the option to select one of your lists that you want to use to build the report or all contacts. To begin, choose all contacts. Then select Create Data as the conversion property. This will show you when your contacts were created in a particular lifecycle. Then select the date range. You can build reports off of a custom date range, previous month, the month to date, etc. At New Breed, we tend to run reports for the previous month. You can use this date range to begin. You have the option to view results by day, week, or month. This will change the appearance of your graph and you should choose based on how you’d like to digest the information. At New Breed, we typically group contacts by week. You can break your report down even more by following a contact property. For this report, we want break contacts down by Lifecycle Stage, so select just that. Leave the final drop down ("Calculate the total value of the following numeric contacts property") blank for this particular report. Finally, you can create the report. This Lifecycle Stage Report will show what contacts are in different lifecycle stages and ultimately the health of your funnel. 2. How many new customers were sourced by marketing initiatives? With Contacts Reporting, you can break reports down by any contact property in your database. Therefore, by creating a customer list, you can analyze how customers were sourced based on a number of different criteria, such as original source type, first conversion, recent conversion and much more. Want to know what landing pages your customers are converting on the most? You can build a report on Recent Conversions to satisfy this. First select your customer list. Then select Create Date as the conversion property. This will show the date your customers' contact record was creating in HubSpot. Then select the date range. For this report, I’d suggest using this month to date for the report. Then select the way you want to group your contacts (day, week, month). To break the down the report more, select Recent Conversion in the first drop down. You can leave the second drop down blank for now and create the report. Your report will show customers that have converted on different landing pages. This is useful for your team and executives to understand what type of content (topic and format) resonates with your buyer personas the most and adjust your content strategy accordingly. 3. How many companies have closed and what source did they come from? At a B2B, C-suite executives care much more about the companies you’ve closed compared to the individual contacts, since that’s the business you’re in. Here’s where the Companies Report comes into play. Go into Reports Home, and select Create a New Report. Then select Companies Report > Start from Scratch. You have the option to select one of your lists that you want to use to build the report, or you can select all contacts. Then select Close Date as the conversion property. This will show you the list of companies that have closed that are in your database. Then select the date range. You can build your report off of a custom date range, previous month, this month to date, etc. Again, our preference is to choose previous month. Then it’s time to break your report more specifically. First, choose how you’d like to group your contacts (by day, week or month). Then, to determine how the company originally came to your website, choose Original Source Type as the company's property breakdown. For this one, leave the last drop down blank and create the report. This Companies Report will show how many companies have closed and from what source they were coming. Ultimately, this helps the entire company prioritize marketing efforts for future growth. 4. How much revenue is generated from particular sources? If you use the HubSpot CRM, there is no integration required. If you use Salesforce, you need to turn on the Salesforce Connector and then turn on Account Sync and Opportunity Sync. If you use Zoho, you can work with Bedrock Data and pay $149/month for its integration. If you have another CRM, you can use the Deals API to set up the integration. Use the previous Companies Report you generated to determine the amount of revenue generated by each marketing channel. To edit, click on the gear next to the report in Reports Home, and select edit. First, change the conversion type to Recent Deal Close Date (as opposed to the currently selected Close Date). Then, finally, scroll to the last drop-down field and choose Total Revenue. Then click Create Report. Now you can see how much revenue you’ve generated using marketing initiatives for different platforms (email marketing, organic search, social media, paid search, etc.). This report will help executives understand what type of marketing is the most cost-effective and lucrative. If some channels are closing more deals and more revenue than others, it is worth investing in more of those channels from the marketing side. 5. What is the ROI of your marketing content? At the end of the day, executives—and investors—want to see a positive return on marketing investments. They want to know that inbound is worth the cost. For example, last year you decided to take on a new medium: video. Videography is expensive and timely, so in order to get the OK to pursue another year of videography, you first must prove the return on the investment. That’s where another Companies Report comes in handy. Then select Recent Deal Close Date as the conversion type. For this example, we want to look at the last year. Enter a custom date range for the past year, or part of the year which you employed video. To break the report down further, select First Conversion in the first drop down. To report on revenue, choose Recent Deal Amount. By doing this, it will pull in the proposal amount documented in your CRM into the report so you can visualize how much revenue you generated all of particular marketing efforts, including video. 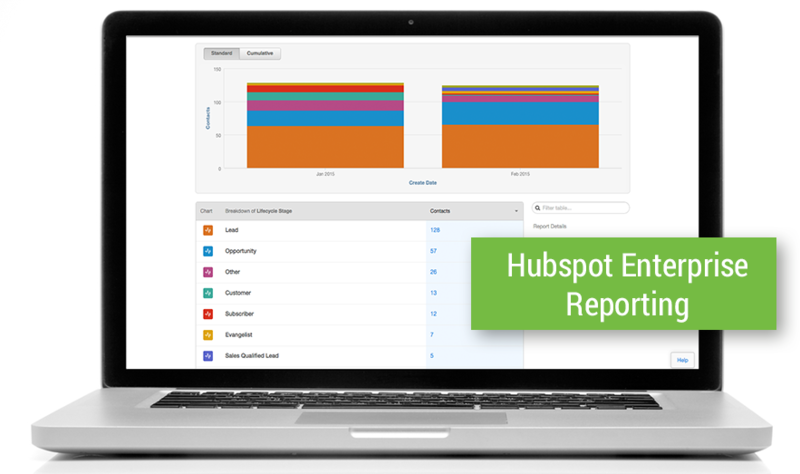 These are only five of the hundreds of reports you can create using HubSpot enterprise reporting. The reports are not only helpful for your company’s executives, but also extremely insightful for your marketing and sales teams, like Attribution reports, A/B testing, and Event reports.